If you have been following my shop for a while, you may have noticed that things have recently taken on a more “metal-smithy” vibe. I go through phases. I get hooked on certain shapes or materials and just get lost in exploring all of the possibilities that lie within. And when I fall into that rabbit hole, it is all consuming. Suddenly I find myself day dreaming about designs or techniques that I want to incorporate. It’s hard to keep me out of my shop. Unfortunately it also keeps me from doing much of anything else, including keeping up with my blog! My bad! It started out innocently enough, with this triangle necklace that had been floating around in my brain for a while. But , as I mentioned before, rings had intimidated me. As had soldering. But while I was working on the rings, the soldering thing became less and less intimidating, and, dare I say, even enjoyable. Any new or improved skill opens a ton of doors and now I could finally unleash another aspect of my inner design beast! I thought I could make a bigger ring and use it as a sort of frame for the puzzle piece that has been floating around my work table for a while, looking for its forever piece. 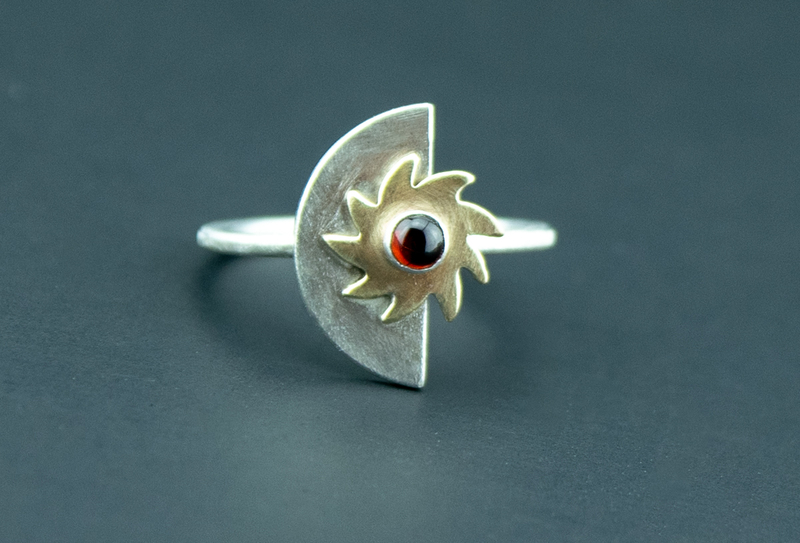 Why not solder one of my moons to a silver ring next? When I took my soldering class last year, the object was to make a pretty little silver ring that had a stone set in it. And it went fine and dandy, until the very last and most crucial class. I attract bad stuff like crazy at times, especially when I am about to come down with a monster flu. Nothing went right that evening. The soldering didn’t work at all, I got my stone stuck in the setting, just trying to see if it fit, I even managed to put my saw blade in upside down and with the teeth facing the wrong way! In short, a disaster. After that I gave soldering a couple more tries at home, before putting it on the “maybe some day” shelf. Until the ring bug bit me. And with a whole bunch of plain and textured rings under my belt, I finally gathered the courage to try myself at creating a ring with a small garnet set on it. Redeemed at last! As of this writing I am waiting for a package to arrive from far far away, that will bring me the same size tourmaline cabochons in many different colors! What do you think? The patina looks a little weird in this picture, don’t you think? So you see? I have turned into a total metal head. But I haven’t abandoned my beloved Czech glass beads. You know me better than that! I’ll leave you today with my newest favorite creation! You can always come and check out what’s new by clicking on the link to my shop above, following my page on Facebook or Pinterest! Thank you! Your support and interest means so much! I love reading about the creative process, so I figured I’d share a little of what goes into bringing my pieces to life! Karin, your jewelry design journey is a joy to watch. In the short time I’ve known you, you’ve come so far both creatively and technically. I look forward to seeing what you do next. Also wanted to tell you what a great photo that is of you on the sidebar – you look fabulous! Dawn, thank you so much! I absolutely love the process of creation and being able to incorporate new techniques has been so much fun! Good things are happening and I hope to be an inspiration to anybody wondering whether or not they should go ahead and follow their dreams!